For a long time now (at least six years), Willis Eschenbach has been going on about governors, forcing and feedback. For a long time now (at least six years), the engineers at WUWT have been pointing out where Willis gets his terminology and concepts wrong. For a long time now, Willis hasn't listened to the experts. Willis Eschenbach maintains, despite all evidence to the contrary, that climate doesn't change. He seems to think that every time a forcing is applied, it will be met with an equal and opposite force. Today he's arguing the same thing that he's argued time and time again. So how about some clarification of the terminology. In this article, I'm using simplified examples to illustrate the main points. It can take a bit to get your head around at first if you're not used to the jargon. It's really not that difficult to grasp, once that light bulb turns on. Forcing - something that causes a change in a particular direction. In climate, the primary cause of a rise or fall in global temperature. Negative forcing - an increase in aerosols (of particular kinds) are a negative forcing, in that it reflects more incoming solar radiation, causing temperature to drop. Positive feedback is something that, in the temperature example, causes the temperature to go up even more. It amplifies the forcing. 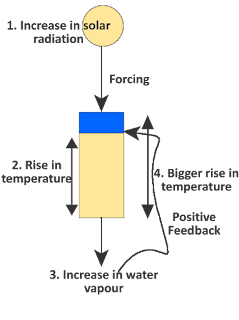 Negative feedback - in the temperature example, causes the temperature to not rise quite as much. It reduces the forcing. It means the temperature doesn't rise as much as it would without the negative feedback. It doesn't cause the temperature to fall. What it does is dampen the signal, not reverse it. Climate forcing is something, usually external to the system, that causes a change. Let's take something simple: incoming solar radiation. The energy from the sun heats up Earth. If the sun increases the amount of energy it's putting out, then the climate will be forced and the temperature will rise. If nothing else happened, the planet would continue to heat up for as long as the sun kept increasing the energy. Once the sun stopped increasing the energy, the planet would settle down to a new energy level and temperature. If the sun then reduced the amount of energy it put out, there would be a negative forcing and, if nothing else happened, the earth would cool. More water will evaporate, which may lead to more clouds, which will lead to more rain and snow. If that were all, then this feedback would have no effect on temperature. 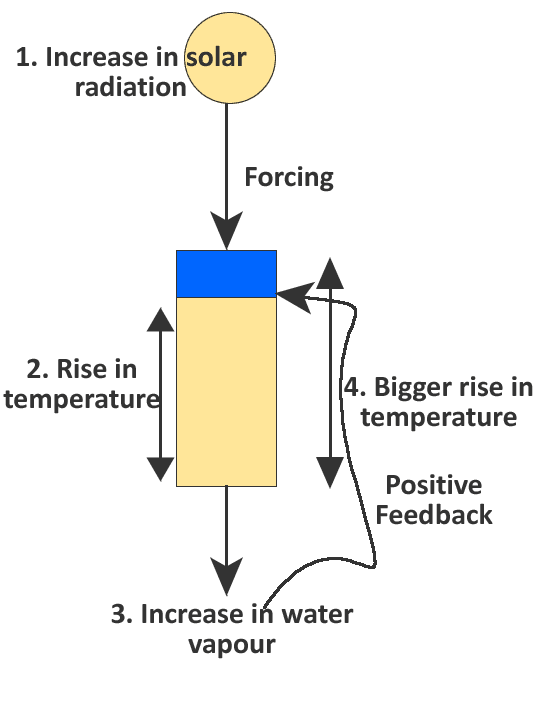 The loss of heat at the surface when the water evaporated would be (almost) balanced by the release of heat up in the atmosphere when the water condensed. This on its own isn't a feedback. It neither amplifies nor dampens the rise in surface temperature. Well, almost anyway. But that's not all that happens. Water vapour is a greenhouse gas. More of it reduces the radiation that leaves the planet, which results in a still warmer planet. The increase in greenhouse gases (water vapour) is a positive feedback to the increase in temperature from an increase in solar radiation. There's more. Because of the increase in temperature, the oceans start to expel CO2, which is a greenhouse gas. This is another positive feedback that makes the rise in temperature even greater than what it would have been without the positive feedback. The negative feedback would be because more clouds will reflect some of the incoming radiation, so dampen the increase in surface temperature. It wouldn't get as hot as it would without the clouds. The positive feedback would be because clouds pose a barrier to long wave radiation leaving the surface and heading out to space. So the temperature rise would be greater than it would without the clouds. Whether the positive feedback is greater than the negative or vice versa depends on the type of clouds. One feedback might cancel out the other, or one might be a bit bigger than the other. ...the underlying climate paradigm is that the forcing controls the temperature, such that a change in forcing causes a change in temperature. On the other hand, I’ve proposed that there is a natural governing system regulating the temperature of the climate, a major part of which works as follows. In the tropics, when it is warm, clouds form earlier and reflect away the sun to cut down the solar forcing. And when the tropics are cool, the clouds form later or not at all, which greatly increases the solar forcing. Here Willis is confusing forcing and feedback. Willis talks about solar forcing. Solar forcing comes from outside the system. It comes from the sun itself. Any cloud response is a feedback, not a forcing. What happens on Earth will make no difference to how much solar energy is put out by the sun. In other words, whether or not clouds form will make not one jot of difference to the forcing. Changes in clouds can be a feedback (as above). What that means is that a change in temperature causes a change in forcing. More water evaporates - an increase in the total amount of water vapour in the troposphere, and a cooling effect on the ocean surface (latent heat of evaporation). More clouds may form - there is more water vapour to condense. This condensation would have a heating effect in the atmosphere - an almost an equal and opposite reaction to the cooling at the surface (releasing heat as water vapour condenses into water droplets). More clouds can reflect more sunlight - a negative feedback, dampening but not reversing the rise in temperature, it heats up but not quite as much. More clouds can mean less heat escapes to space - a positive feedback, exacerbating the rise in temperature - it heats up more. More ice will melt and less snow cover - both positive feedbacks, with less sunlight reflected back to space, and more darker surfaces exposed absorbing heat - exacerbating the rise in temperature. And that is why I say that the current method of analyzing the climate is totally incorrect, because it assumes the causation is going the opposite direction from what is actually occurring. dampen the rise in temperature, meaning it will rise, but not as much as it would without the feedback - negative feedback. You'll not get a reversal or any change in the forcing itself. How could you? Earth has little to no control over the sun. The sun is much more powerful. Same goes for adding greenhouse gases. That will result in a rise in temperature. Greenhouse gas forcing will raise the temperature. There's no escaping the fact that adding more greenhouse gases to the air will raise the temperature of the planet - the oceans and the troposphere. There will be positive feedbacks that will make the temperature rise even higher; and negative feedbacks that will dampen the rise, so it's not as great. Whatever - the net effect is still a rise in temperature. Willis started off his article talking about governors and cruise control. He got that wrong too, as he has done before. With the biggest sub-group at WUWT being engineers, there were lots of people ready to point out his errors - as there have been on previous occasions, when Willis took just as much notice (ie none). “A common example in our daily lives is the cruise control on your car. It increases or reduces fuel flow (positive and negative feedback) to maintain the vehicle speed near some pre-set value." Willis , you really need to find out what the terms mean if you want to discuss this kind of thing. Positive and negative f/b does not relate to whether the thing being driven is going ‘up or down’. A negative f/b is one which acts to counter a deviation and a positive one is one which acts to increase it further. If a hill slows the vehicle down, the cruise control acts as a negative feedback by increasing the gas. The Stefan-Boltzmann law is a governor of sorts, increasing or decreasing radiation by the 4th power in an effort to maintain a temperature. It amazes me how many people do not understand the concept of set point and diff! A governor is a control device that applies a negative feedback. Paul Schnurr finds the engineer talk interesting, but still thinks Willis makes a good point. He doesn't. It’s interesting to learn how engineers define and use “positive” and “negative” when discussing feedback but for laymen Willis’ example is clear no matter how feedback is defined: a changing temperature can change forcing to one which acts to reverse the temperature change. At least that’s how I see it. The runaway unravelling of WUWT is powerfully kinetic. DUCK JUDITH! Eli calls the L'Chatelier's fallacy. Very common amongst beginning chemistry students. Someone needs to ask Willis how his tropical thunderstorm/cloud model accounts for the repeated advance and retreat of glaciers. Is it the result of the car being driven on cruse control falling off a cliff or running out of gas? Not sure that Willis believes in ice ages. He often says that in the twentieth century temperature changed by +/- 0.3C. He doesn't know it just kept going up and up. He lives in his own little world of make-believe. Willis is as scientifically illiterate yet rhetorically blessed as they come. The gullibles fall for his schtick every time. 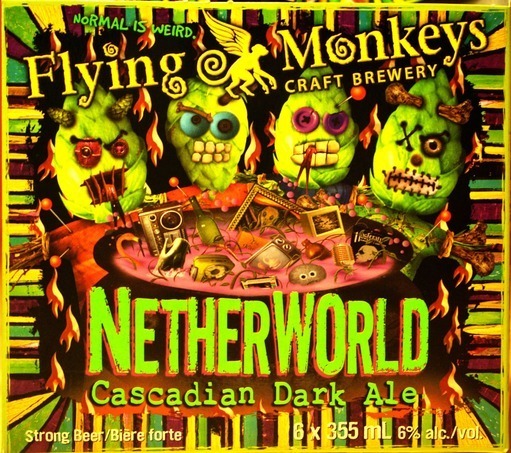 What gives a flying monkey good taste? Four years in an Ivy Leave school. What does a flying monkey learn first in school? His Apey-cees! It isn't that long ago that some deniers with better scientific credentials than Willis were 'proving' that climate was essentially stable by, well, assuming that climate is relatively stable. At least this time it is just honest stupidity that is involved. Or sponging up too much alcohol. And in other news... Locusts are eating everything in sight in Russia. Over here it's the mosquitoes, they're huge, I saw three beating up a crow for lunch money. Even a slight knowledge of palaeoclimate behaviour is sufficient to show that WE is wrong. If cloud feedbacks were sufficiently negative to offset an increase in total net forcing, then the Earth would still be stuck in a glacial. Nor would hyperthermals like the PETM be physically possible. The climate homeostasis argument is the insensitive climate system argument and it is very, very obvious that the climate system *is* fairly sensitive to radiative perturbation. This, by definition, means that feedbacks net positive, not negative. WE is wrong, QED. It beggars belief that WE is still peddling this obvious claptrap after all these years and all the correction he has received. Of course he could submit his notions to Nature for publication. But "obviously" his theory would be rejected on political grounds. I note your engineer comment and have run across that subgroup elsewhere in numbers. I don't know what it is about an engineering education/mindset that makes at least a subgroup out and out cranks, but it is seen all the time. My own brother included. Anyway, this seems like some sort of techno-babble version of the same notions as you see in the fundamental Christian Cornwall writings. Is Willie a signatory to them? The Salem "hypothesis" is really just the same _observation_. What I'd ber curious about is the explanation for the apparent correlation, or if in fact the apparent correlation is more true than apparent in the first place. Just putting a name to the phenomenon. But if you follow it around there are a few sites that discuss the aetiology - most think that the correlation is more than apparent.